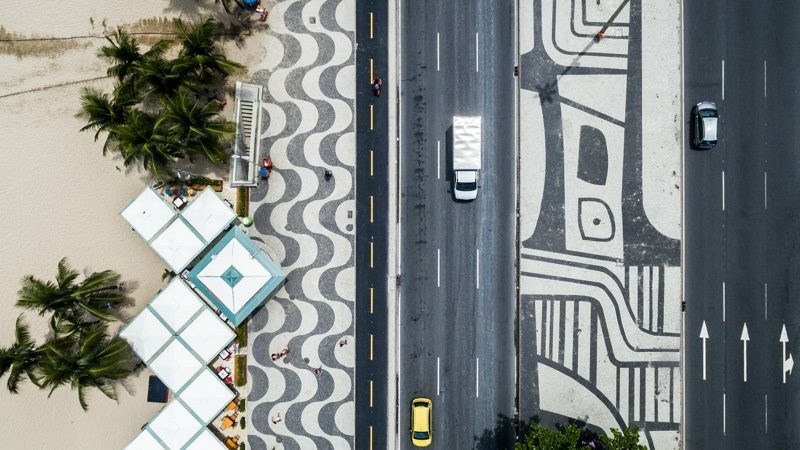 Welcome to Meeting Mojo, a platform to support potential applicants in finding partners for the Newton Fund Urban Innovation in Brazil Collaborative R&D competition focusing on innovative, connected cities and renewable energy solutions. On behalf of the funders Innovate UK and Ministry of Industry, Foreign Trade and Services (MDIC), Brazil Brazilian Development Bank (BNDES), and Brazilian Agency for Industrial Research and Innovation (EMBRAPII), the Knowledge Transfer Network (KTN) is hosting this platform for both Brazilian and UK applicants. Meeting Mojo allows you to search for and message potential partners to form a consortium for this competition. Please note that there will not be any physical meetings held - all activity will be hosted online for you to pursue further. 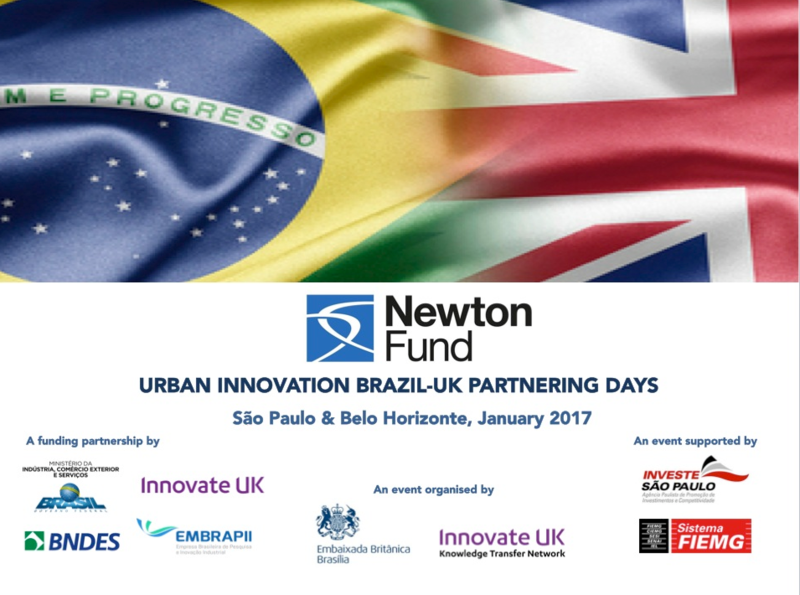 Brazil's Ministry of Industry, Foreign Trade and Services and UK's Innovate UK are running the Urban Innovation in Brazil call for proposals for collaborative research and development projects between British and Brazilian companies focusing on innovative, connected cities and renewable energy solutions. Similar to the UK, today in Brazil 85% of people lives in cities (worldbank.org). This has created a wealth of opportunities for those moving to urban centres, yet also it has accelerated the development of unique challenges for the future development of cities in Brazil. Challenges such as improving energy, waste and water efficiency, developing infrastructure to meet current and future energy and service demands by residents (and visitors), while also promoting economic participation and harnessing education and skills within and around cities. 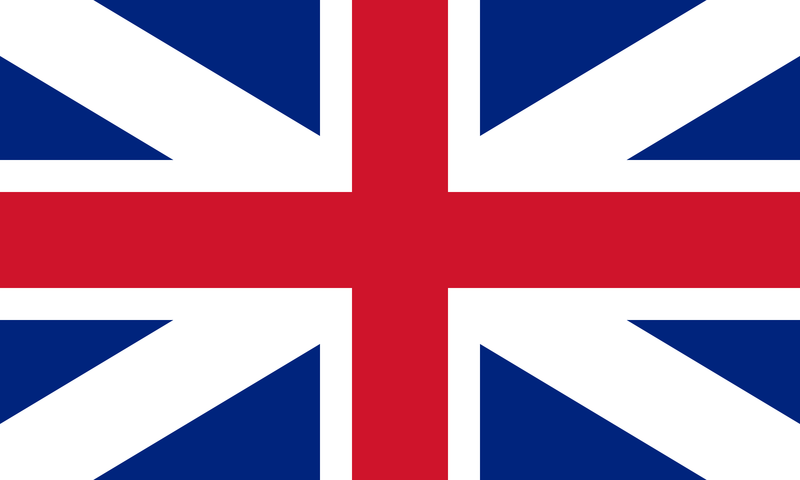 Innovate UK will provide funding support to the UK project partners. BNDES only: projects are supported only by BNDES refundable loans. EMBRAPII only: projects are supported only by EMBRAPII non-refundable grants (requires the participation of an EMBRAPII-accredited research institution - EMBRAPII Units and/or Poles). BNDES and EMBRAPII: projects are supported by a combination of BNDES loans and EMBRAPII grants. Application deadline: 3 May 2017 - 12:00 noon UK time, 08:00 local time Brasilia. 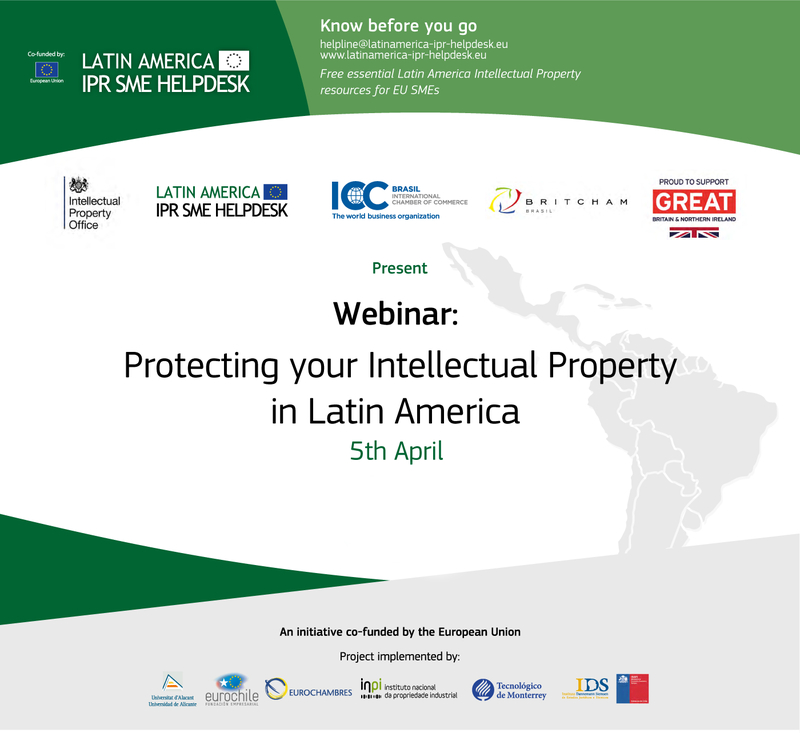 A webinar run by IPO, DIT, ICC and BritCham to give an overview to European SMEs and SME intermediary associations as to how they can best protect their IP in Latin-American markets. The experts will provide practical information on how to register, protect and enforce trade mark rights in the region and how to effectively protect the company logos or products, as well as how to proceed with regard to inventions, designs and copyright-protectable contents. SMEs will also be provided with expert tips to bear in mind before, during and after entering the markets in these territories. In addition, queries from companies will be answered by the experts during the session. UK: Advizzo; Amphibia BASE; Allot Ltd; Bathwick Electrical Design Ltd; Bio Nano Consulting Ltd; Exergy Ltd; Glasgow Caledonian University; IMGeospatial.com/ Intelligent Modelling Ltd; Integrated Environmental Solutions; Green Fuels Research Ltd; Kelda Technology; OXTO Energy; Revolutionary Turbines Ltd; University of Derby; University of Reading - School of the Built Environment; University of Warwick; Utilities Manager Ltd; Ventana Systems UK. 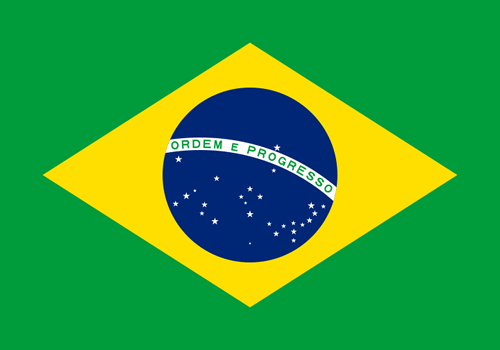 Brazil: CERTI Foundation; COSOL; EMPLasa - São Paulo State Company for Metropolitan Planning; Instituto Tellus; Institutos Lactec; IPT – Institute for Technological Research of the State of São Paulo; Instituto de Tecnologia da Informação e Comunicação (ITIC); KNBS Telecomunicações e Informática Ltda; Kumumi; Polytechic School of São Paulo; Sevenia; Sol Lar; State University of Maringa; University of São Paulo; WINGS Telecom. 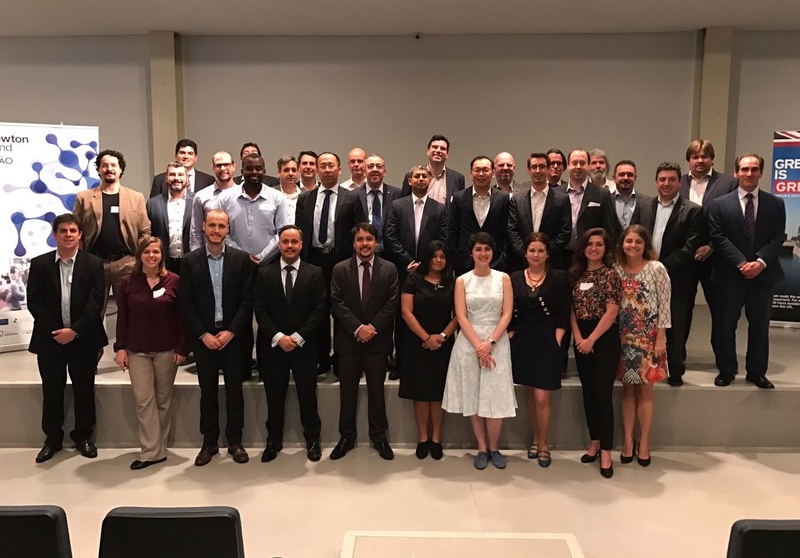 In January 2017, a delegation of 14 organisations from the UK travelled to São Paulo and Belo Horizonte to meet with potential Brazilian partners. Documents and presentations from this visit are now available. An album of photos taken during the visit. Go to the 'Register' icon at the top menu and complete the form. Remember - the more details you include, the easier it will be for other participants to understand what your organisation is offering, and what kind of partners you need to complete your consortium. Starred fields are mandatory and your application cannot proceed without them. Once you have submitted the form, you will be sent an automatic email to confirm your application is being processed. Emails are sometimes filtered by your provider, corporate IT or application settings. If you don't receive an email, please check your Spam folder. It will take up to 24 hours (Mon-Fri) for the site admin to confirm your registration. Until your registration has been confirmed, you will not be able to search for partners. However, in the meantime, you can log into your account and add any other details if you wish - an organisation logo, or additional people from your organisation. Once your registration has been confirmed, you will receive an automatic email with your login details which will also include a link to authorise your account. In the top menu on this page, click 'Search' to view and search listings. On the left of the page is a search tool to help refine your selection - you can sort by country, by type of organisation and registrants' area(s) of interest based on the competition scope. Please note that if no registrants have yet specified a particular area of interest, it will not appear on the drop-down menu. Alternatively, to see who has newly registered, you can order by date of entry using the selection tool above the listing. The search tool is hierarchical, so the second category you select will be a subset of the first. If you then wish to start a new search, please click 'Reset' on the Search tool before starting again. In your chosen participant's entry, click on the 'Send message' icon to start your discussion. The participant will receive an email to alert them to the fact that you have sent them a message. Your sent messages are displayed in your 'Messages' section. If another participant has sent you a message, you will receive an email informing you. DO NOT reply to this email direct (it has been automatically generated by Meeting Mojo and any replies to it will not be received by the participant). You will need to log into Meeting Mojo and reply to the message via your 'Messages' section. Any queries about Meeting Mojo? Check the FAQ guide which contains instructions on how to use Meeting Mojo, including how to reset your password. The Knowledge Transfer Network is the UK's Innovation Network. It works closely with Innovate UK on networking activity around the Newton Fund, crucial to help participants to meet and develop collaborative partnerships. Find out more here.